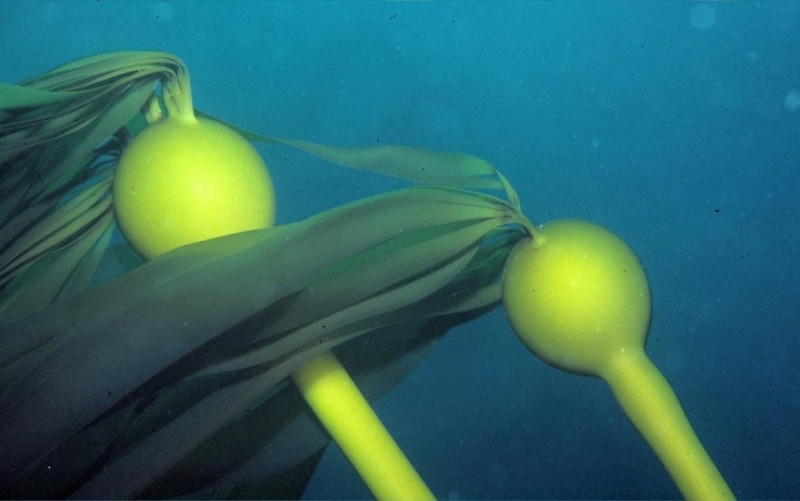 Bull Kelp begins with a large, branching hold fast supporting a long, hollow stipe that starts narrow and widens at the top, ending in a tennis-ball shaped float. 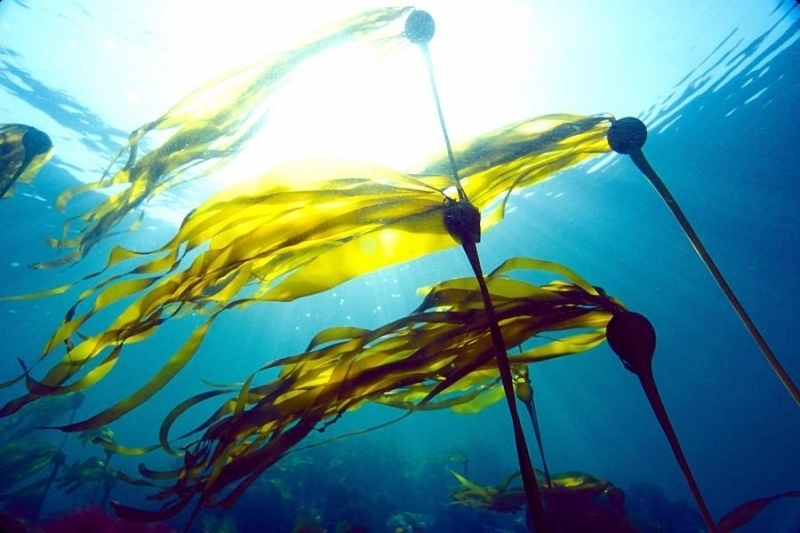 Attached to the float are long, flat blades a few inches wide and up to 30 feet long. 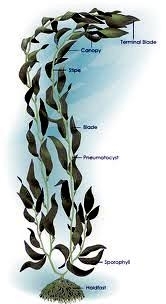 The blades are arranged in 2 groups like pig-tails and tend to trail on the surface of the water. 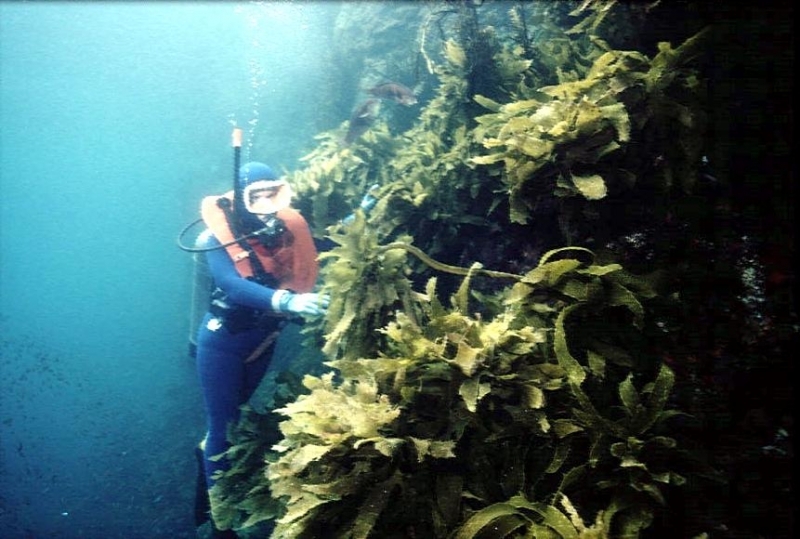 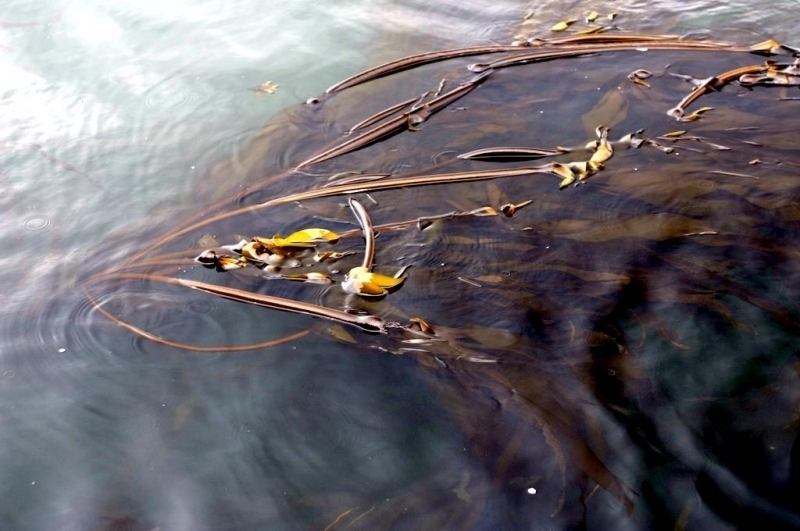 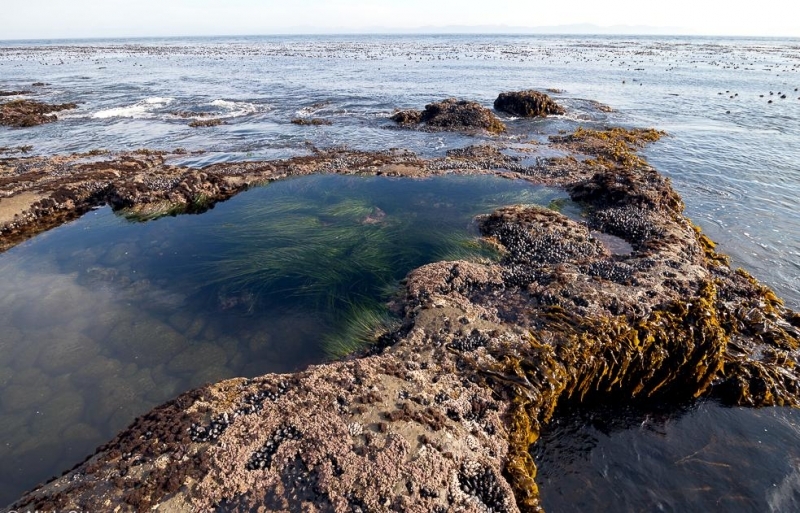 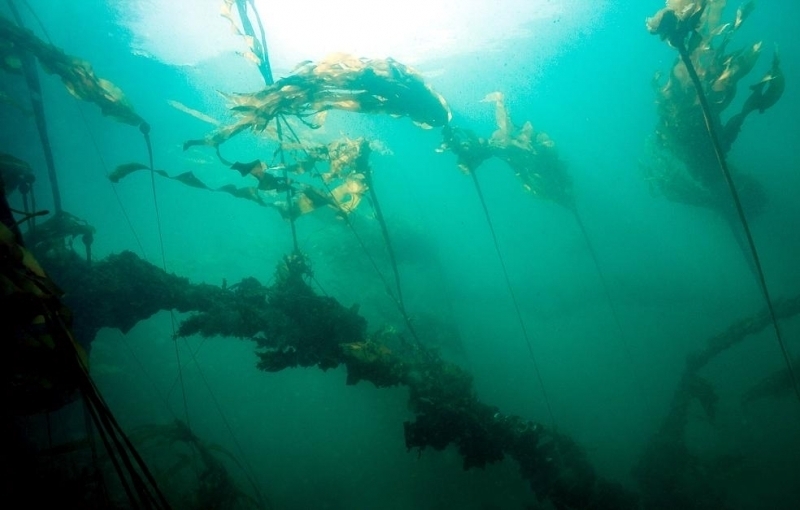 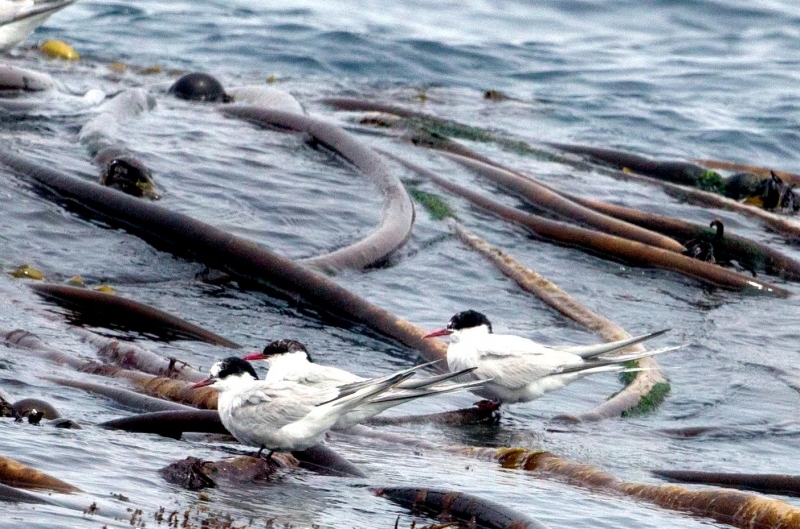 Bull Kelp grows & thrives in rough-and-tumble coastal waters. 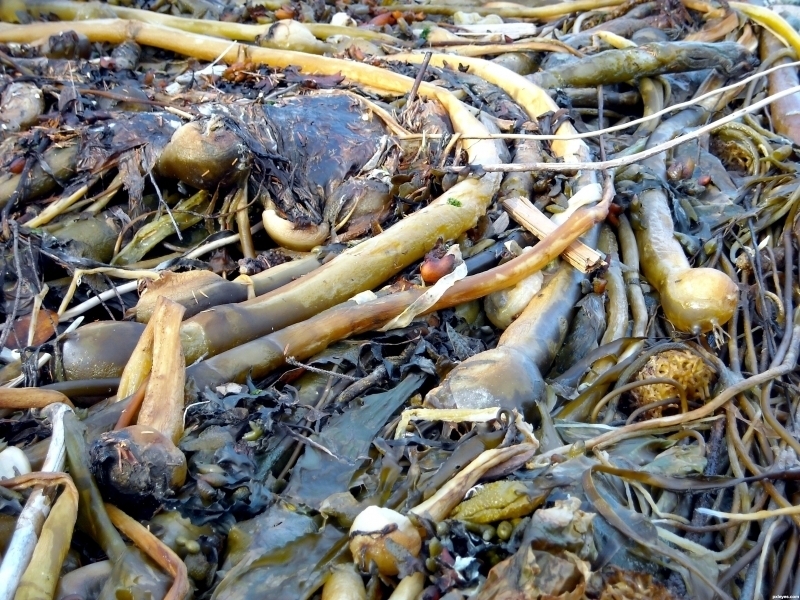 It’s aided by its root-like holdfast, which has many finger-like projections (haptera) that hold the plant tight to rocks. 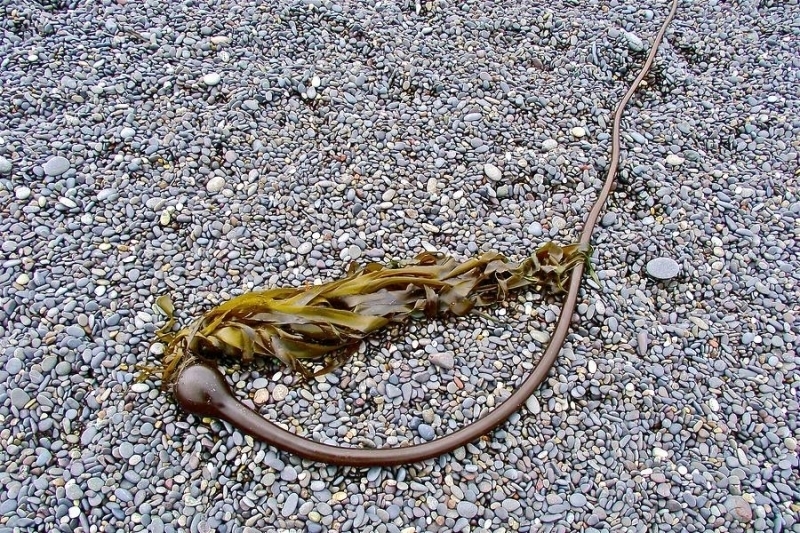 From the holdfast, a flexible stem (stipe) extends 30 to 60 feet (10-20 meters), gradually enlarging to form a single, round float. 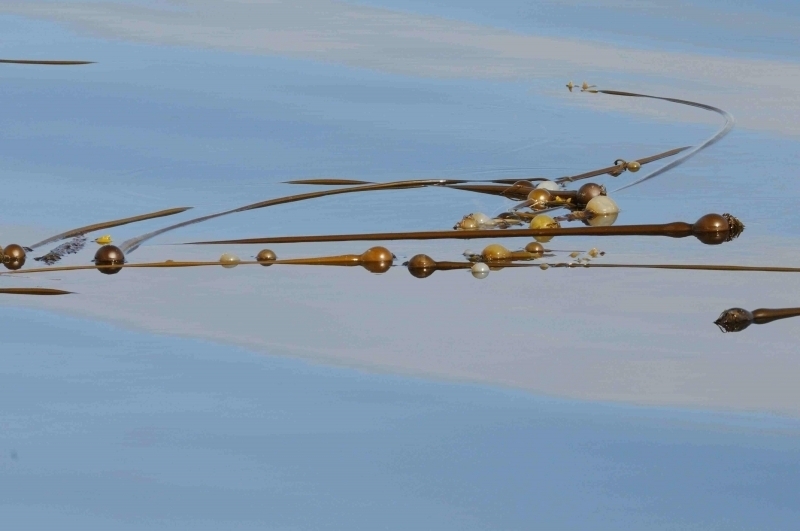 As many as 30 to 64 long, narrow blades grow from the float and form a golden-brown canopy on the water’s surface. 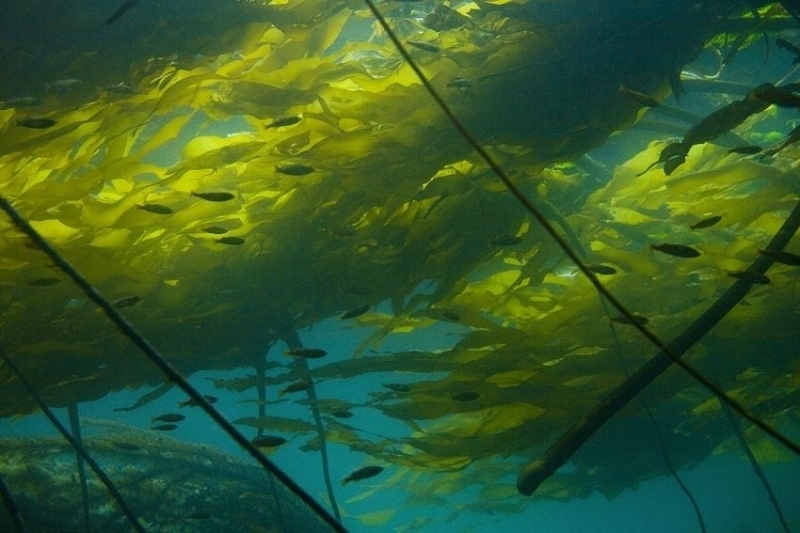 Bull Kelp is an annual seaweed, meaning it grows from a spore to maturity within a single year. 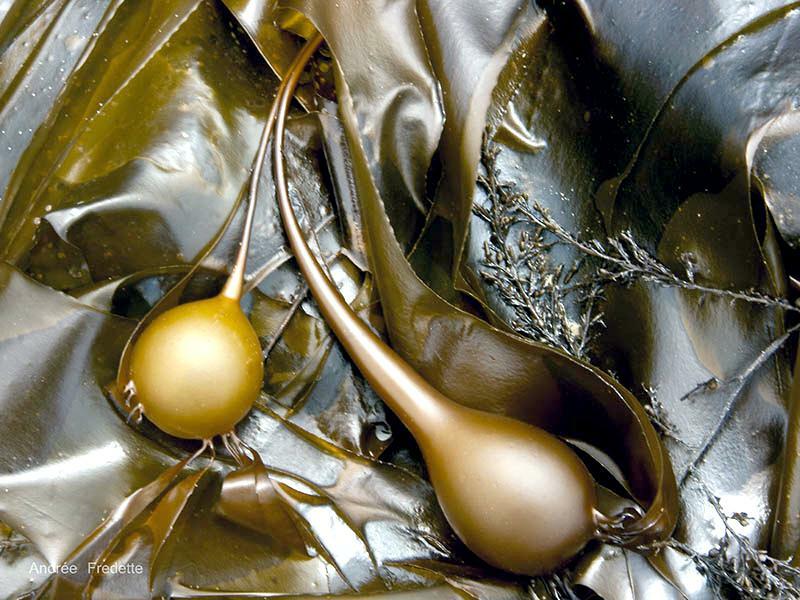 Bull Kelp reproduces by spores in spore patches (sori), which are heavy enough to fall to the ocean floor. 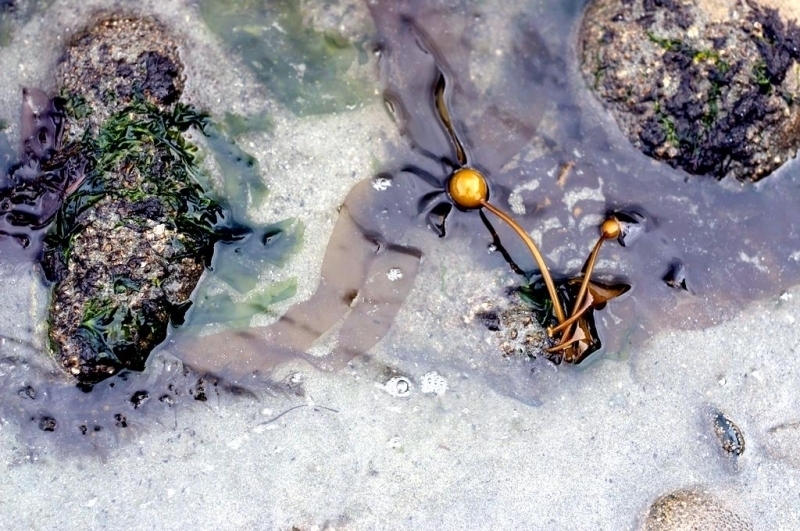 This ensures that spores settle close to parent plants and on suitable substrate. 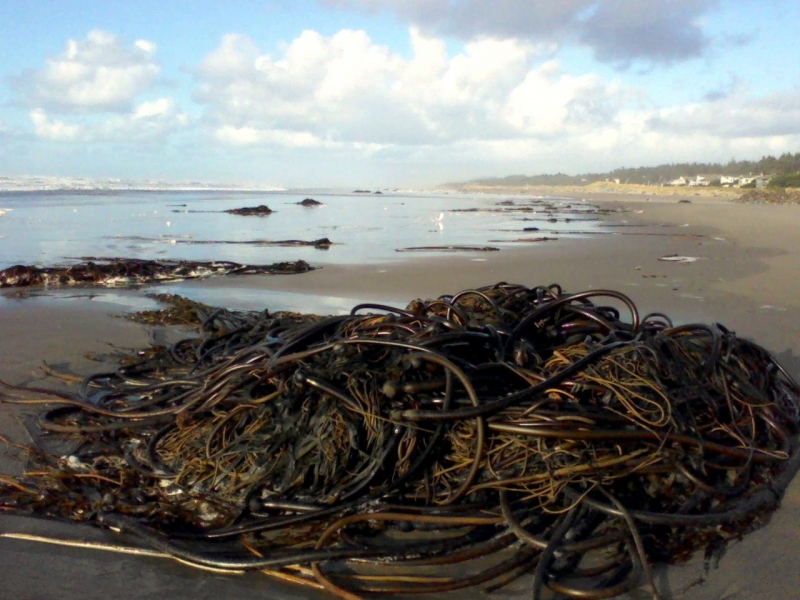 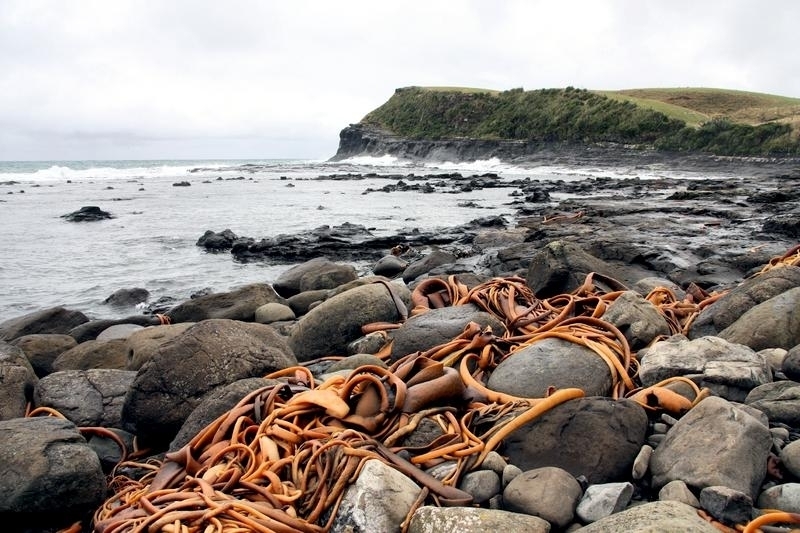 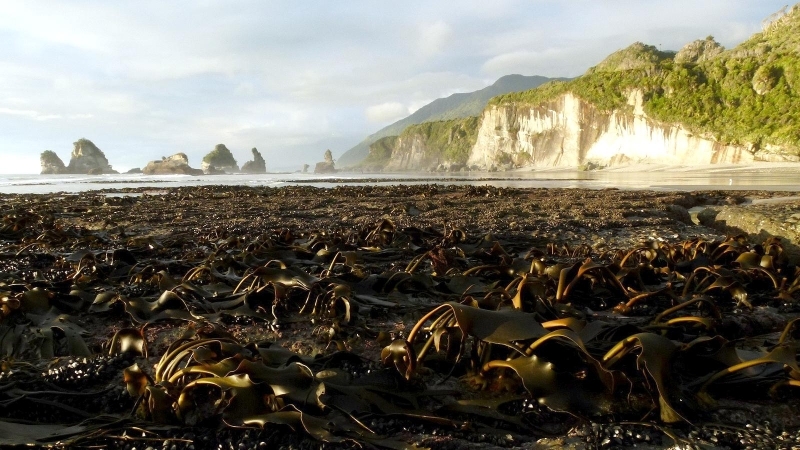 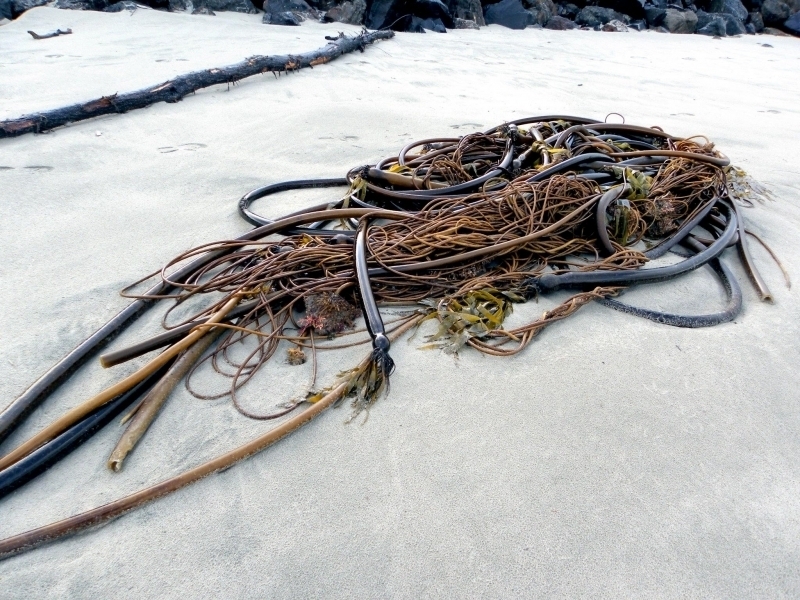 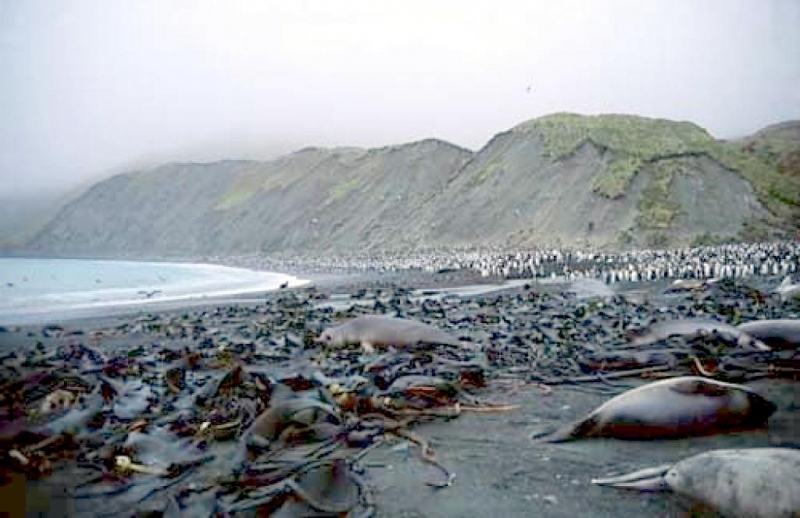 Winter storms wash spent bull kelp onto beaches where the plants dry and turn brown. 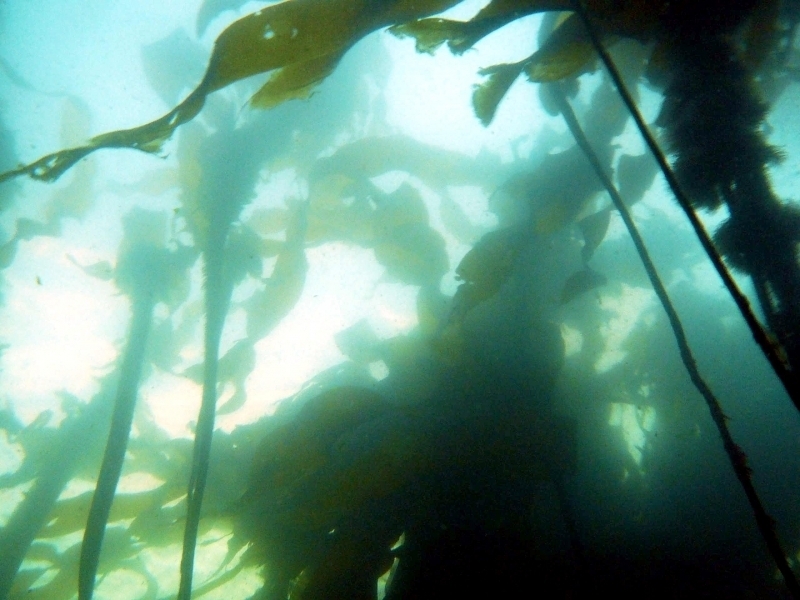 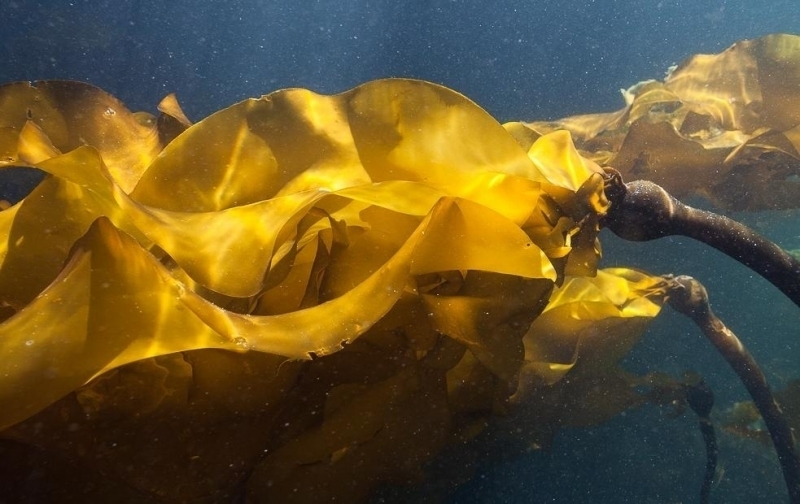 Bull Kelp is harvested to make a variety of commercial products, but the harvest must be carefully regulated to avoid harming the kelp forest ecosystem. 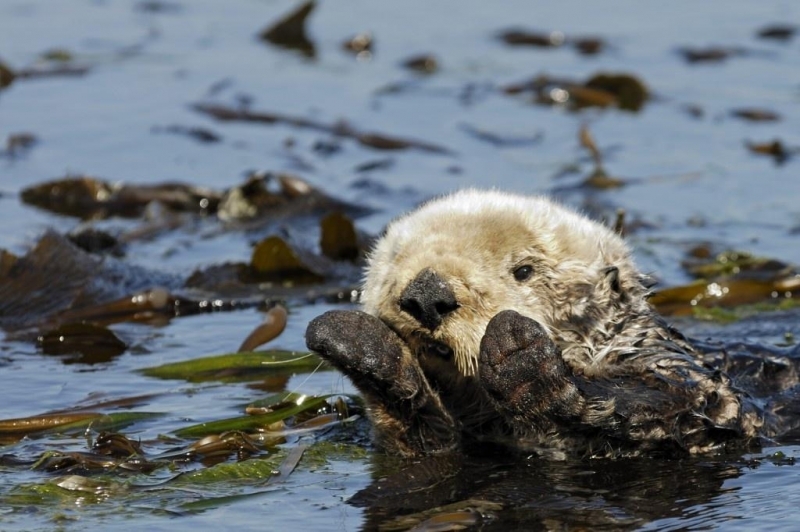 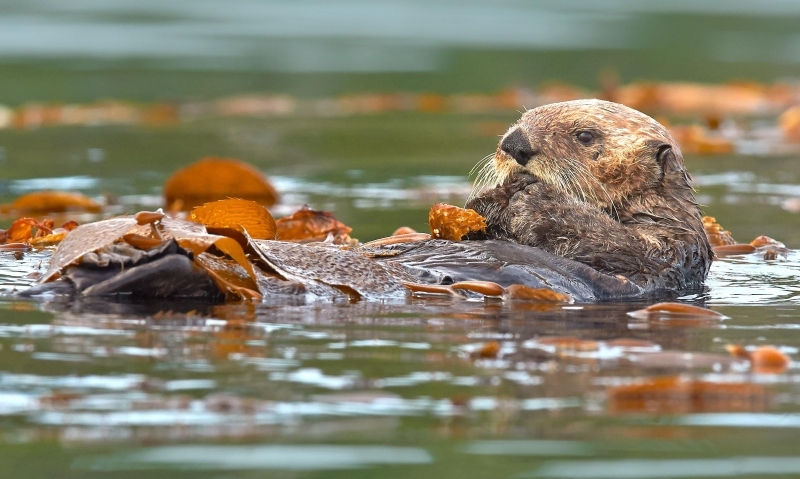 Pacific Sea Otters thrive in kelp forests too. 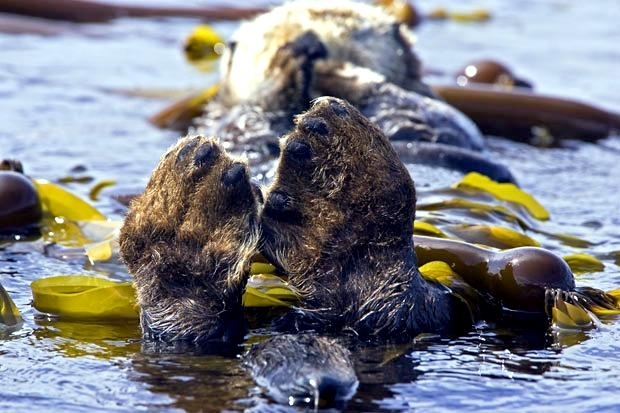 They can find their favorite foods on the forest floor, then take an after-lunch nap in the forest’s golden canopy, often wrapped in a flexible group of stem to keep from drifting away. 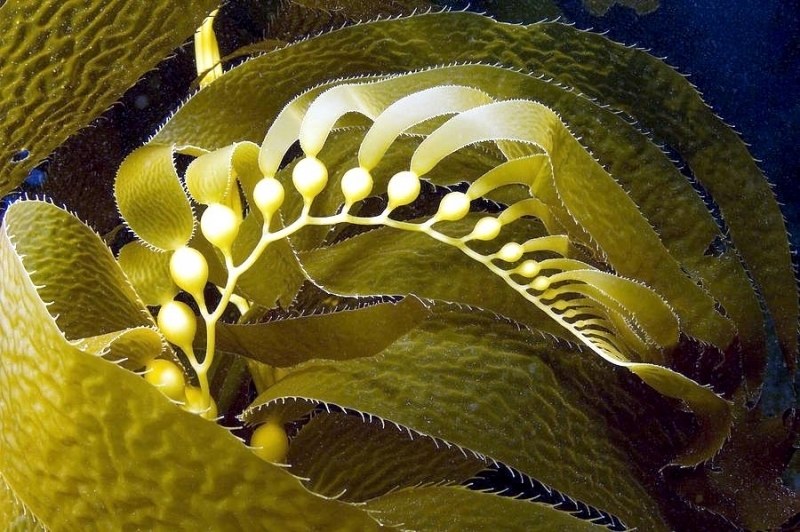 Nereocystis this plant’s genus, is the Greek word for “mermaid’s bladder”. 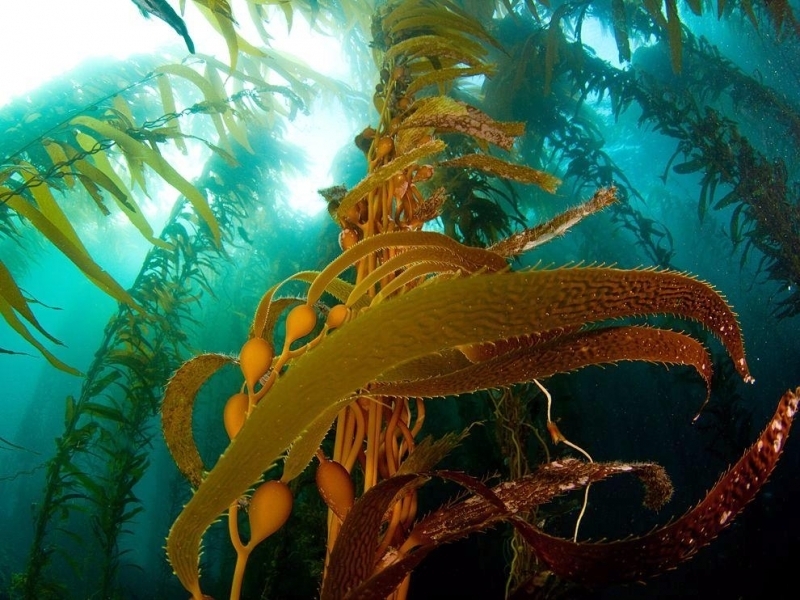 * Bull Kelp is an annual plant that grows entirely in 1 season, spring to fall. 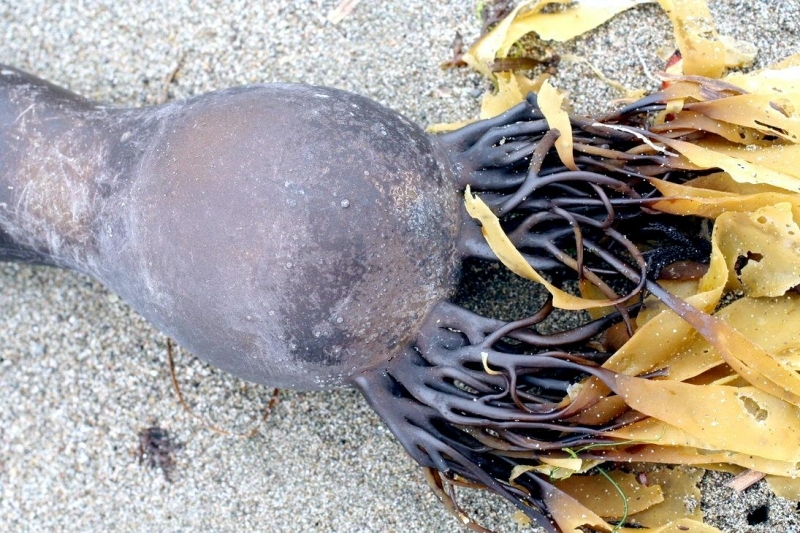 It can grow up to 2 feet in 1 day alone. 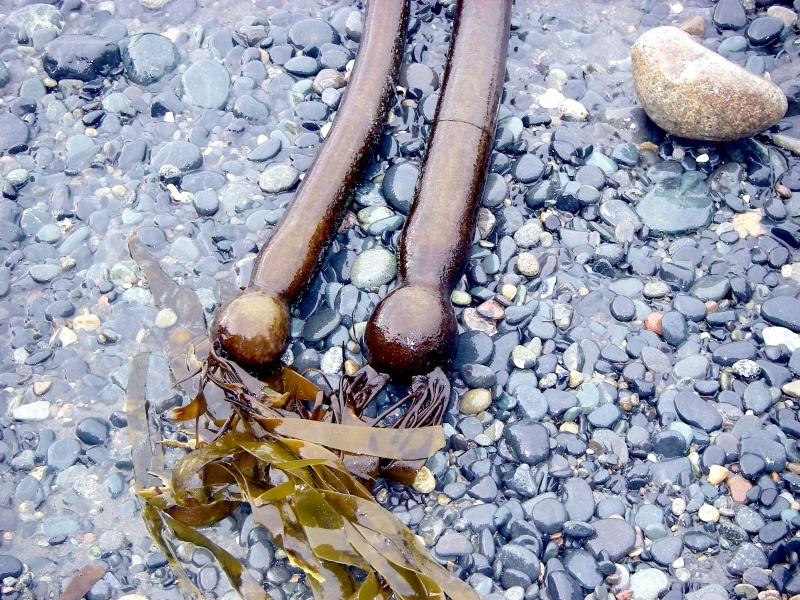 It can grow to a total length of over 100 feet. 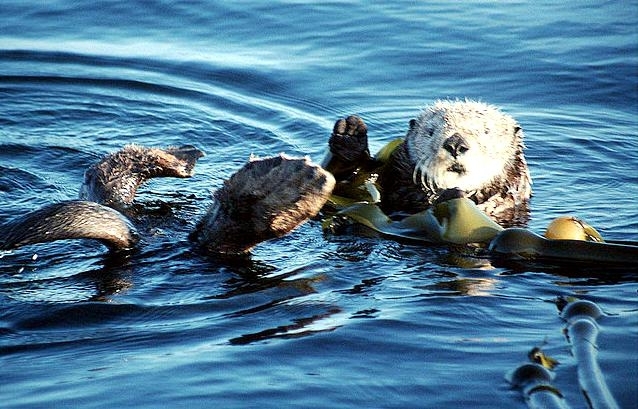 The blades can grow up to 10 feet long. 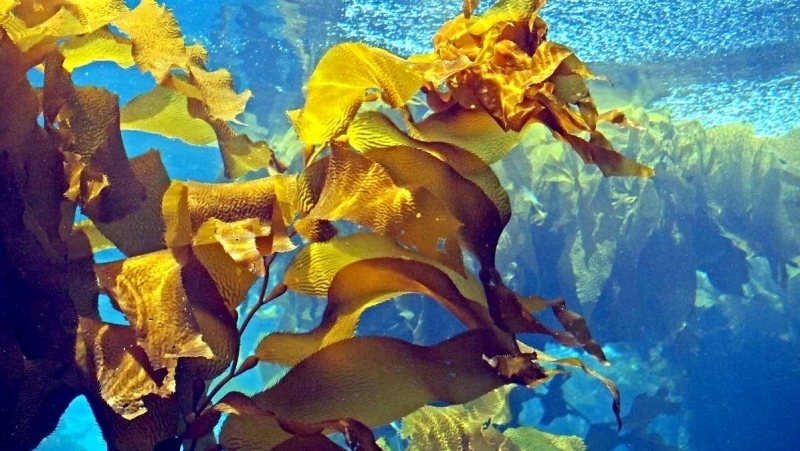 * Bull Kelp is the largest form of brown algae. 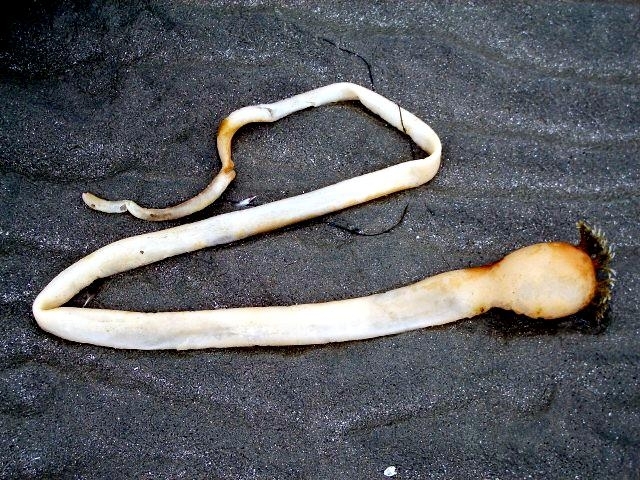 It has a large bulb on the end of a long tail called a stipe. 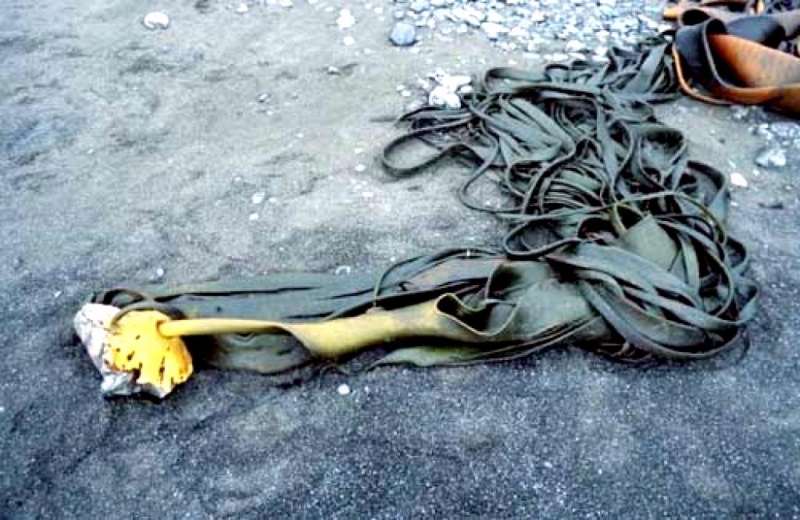 It is attached to the sea floor by it’s roots called a “hold-fast”. 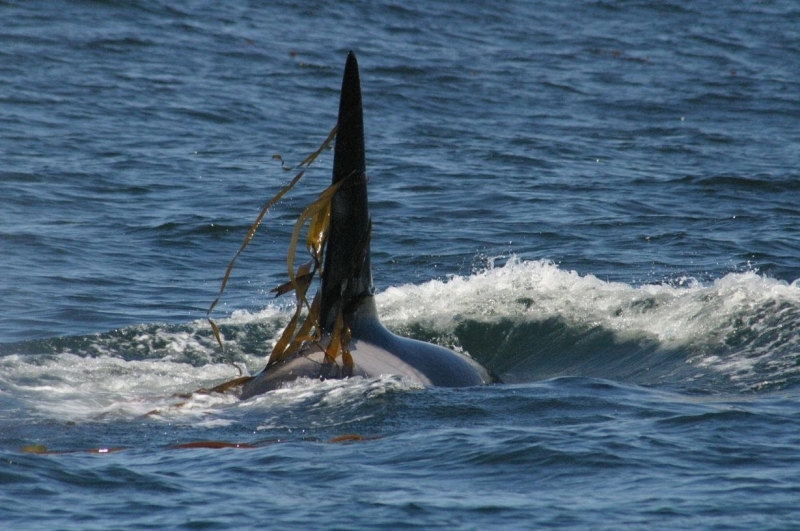 Attached to the bulb are long flowing blades of kelp. 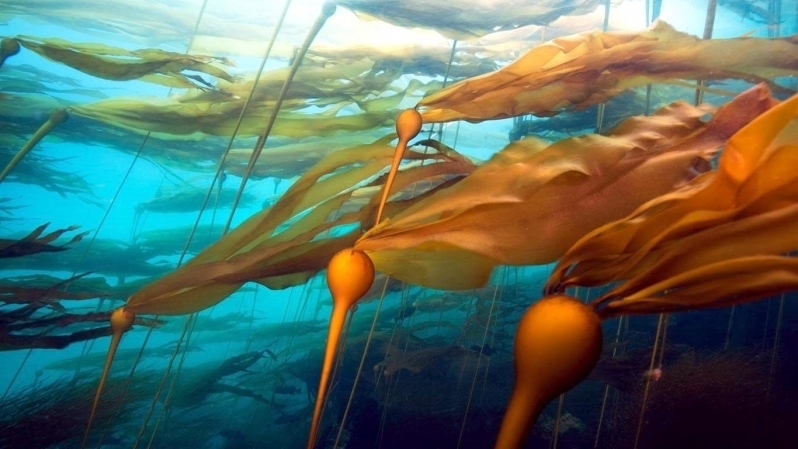 * The bulbous float at the end of the Bull Kelp is filled with up to 10% carbon monoxide gas. 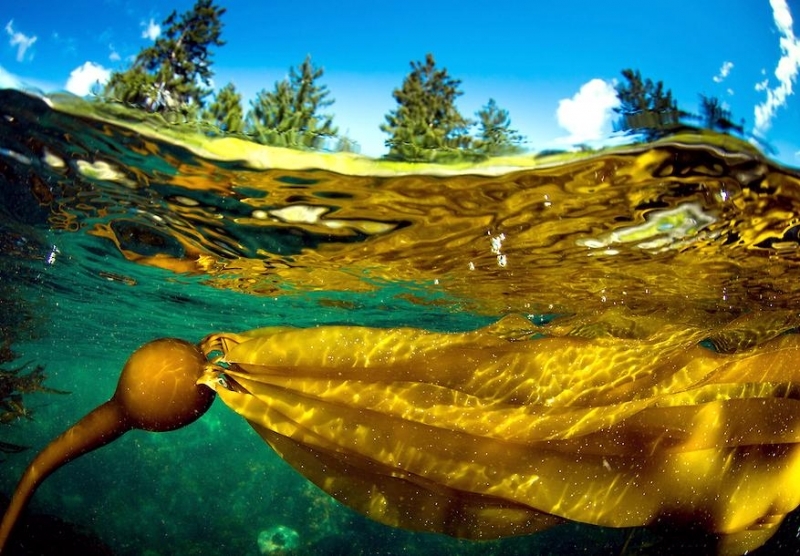 The gas-filled bulb floats on the surface of the ocean allowing the plant to get the sunlight it needs. 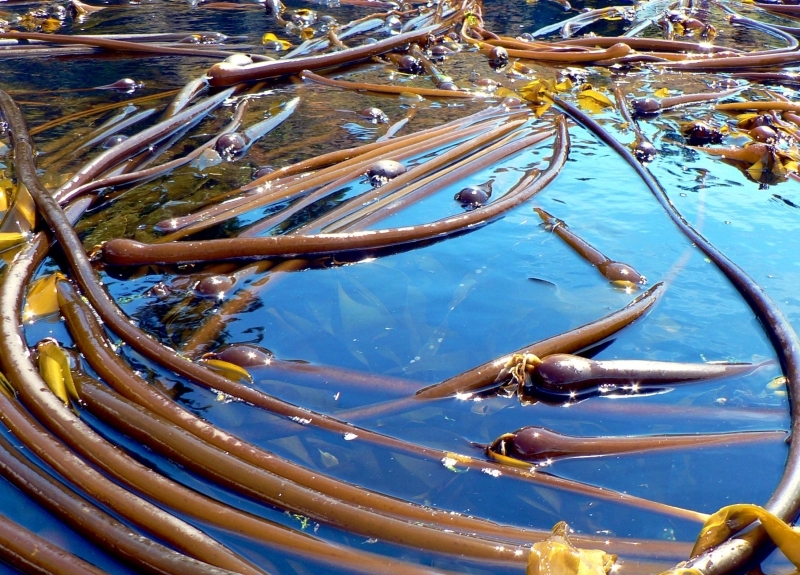 * Bull Kelp grow in “forests” along the rocky shelves of ocean headlands. 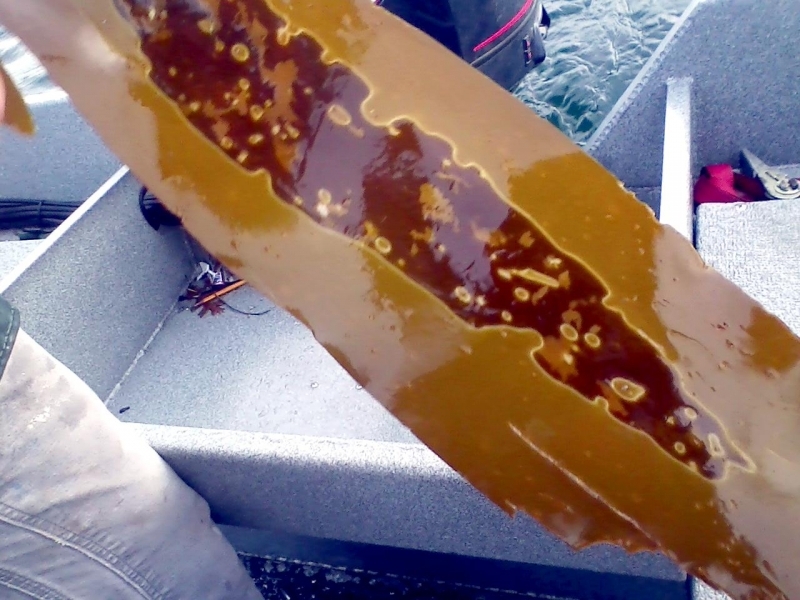 They help reduce the effects of corrosion as well as warn boaters of shallow reefs. 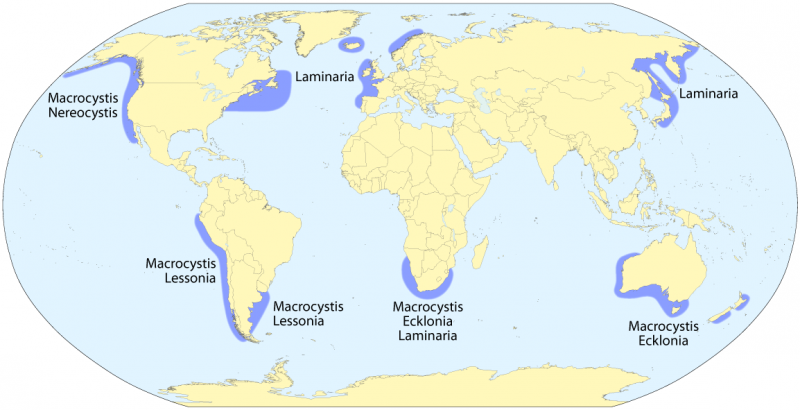 * They are a unique biosphere that shelter many species of fish, shellfish & sea jellies. 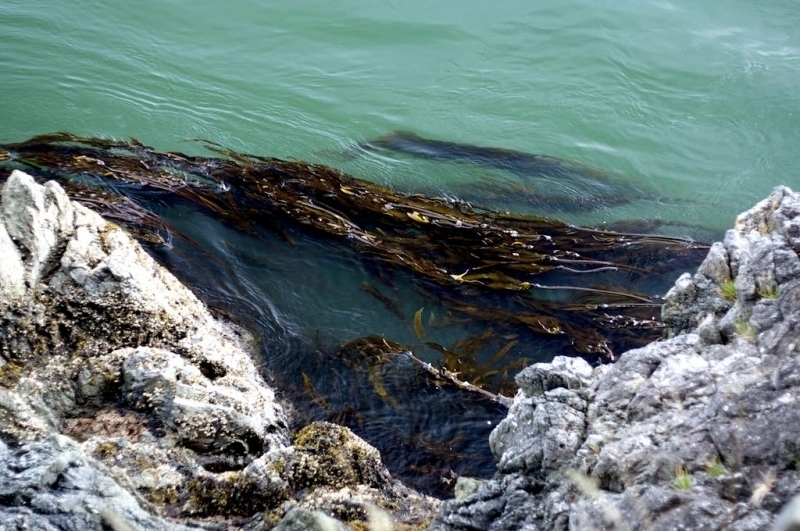 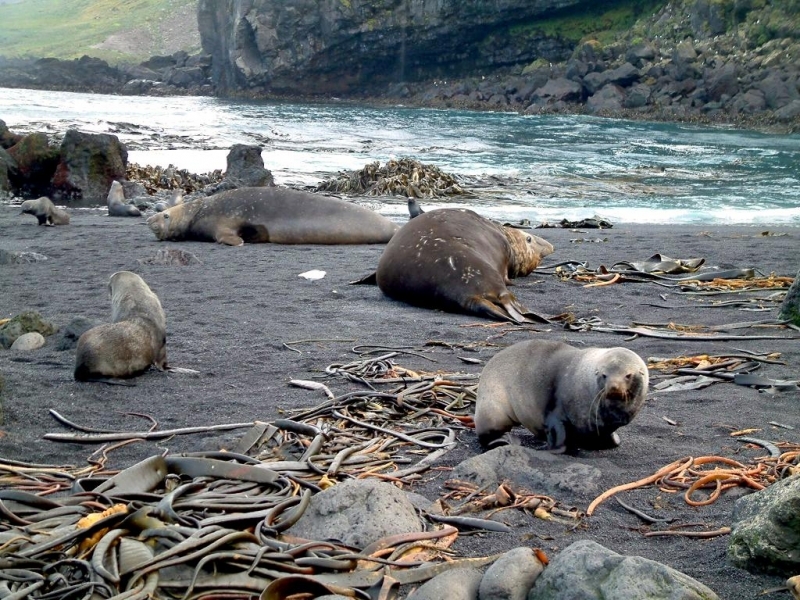 They are a great feeding ground for seals & sea lions. 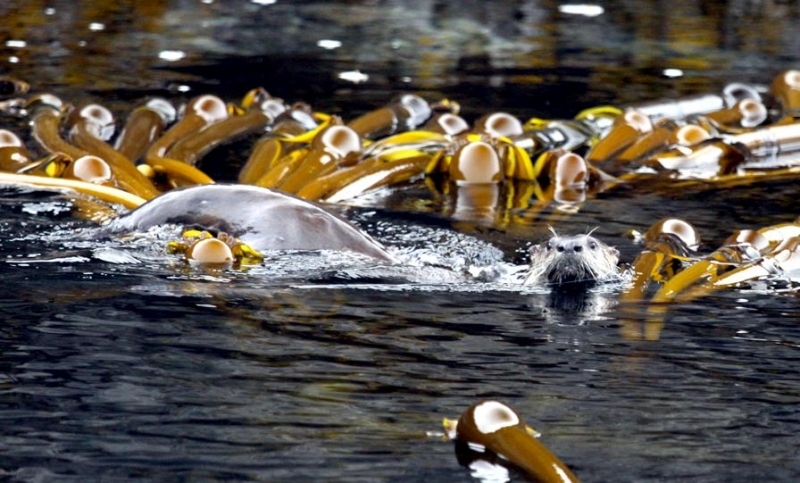 * Bull Kelp has many names including Bullwhip Kelp, Ribbon Kelp, Giant Kelp, Horsetail Kelp & Sea Otter’s Cabbage. 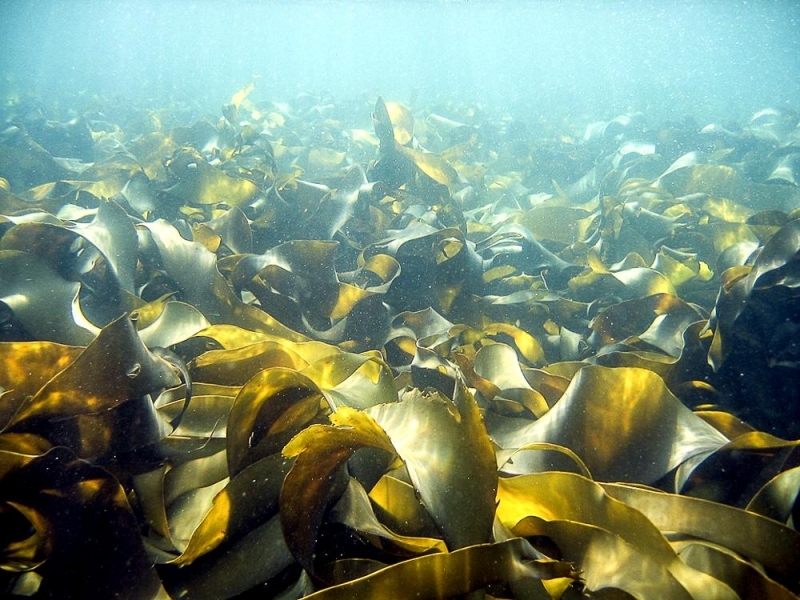 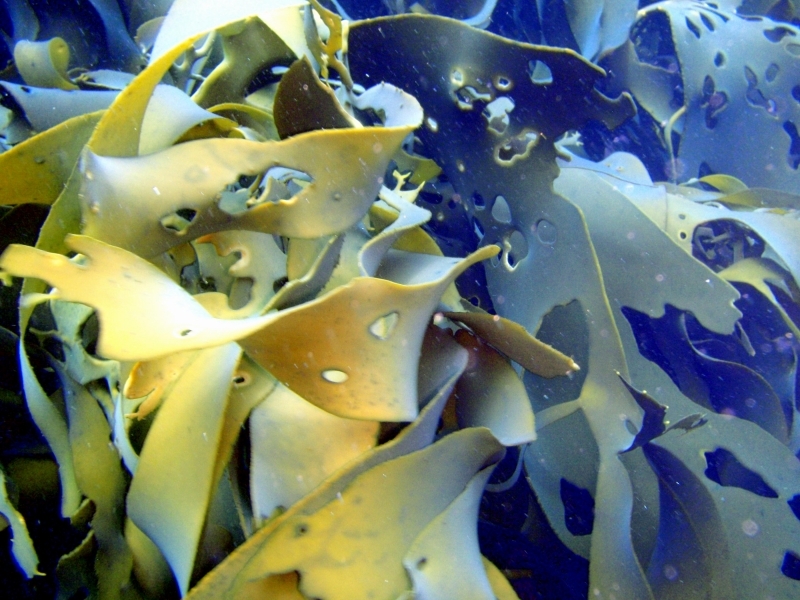 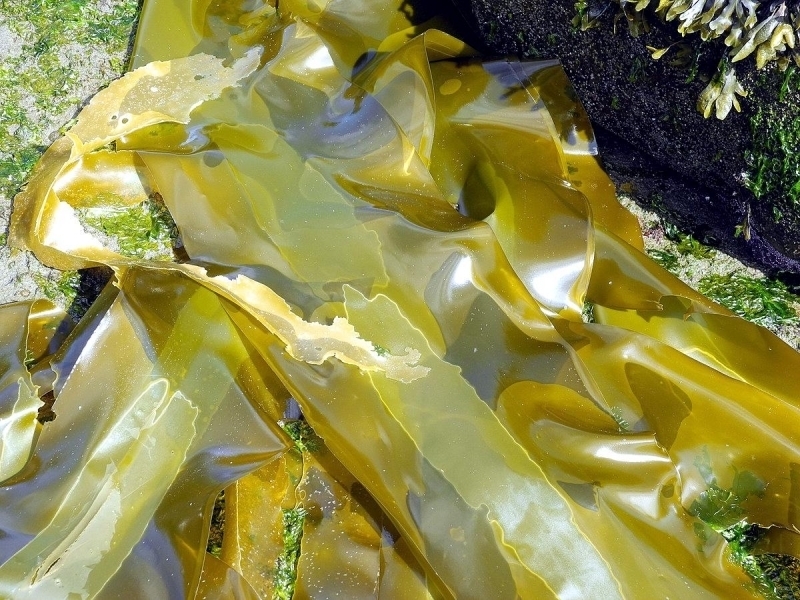 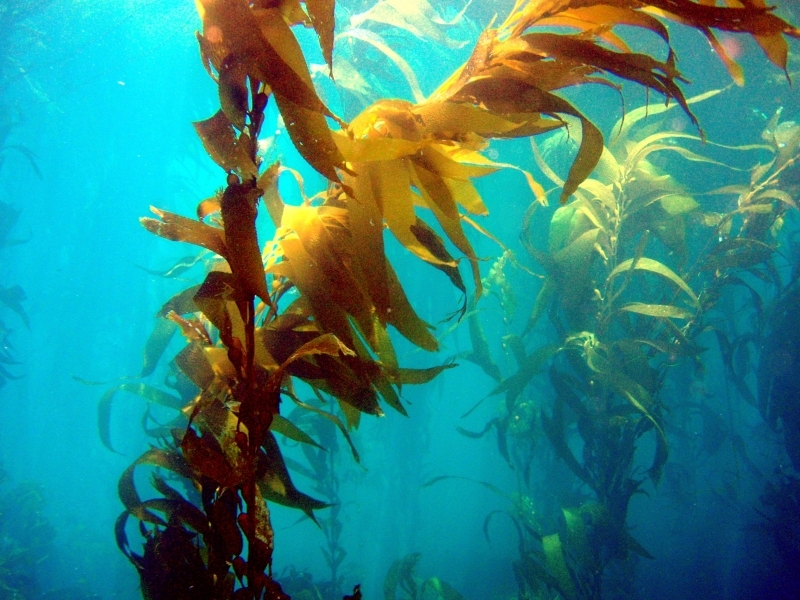 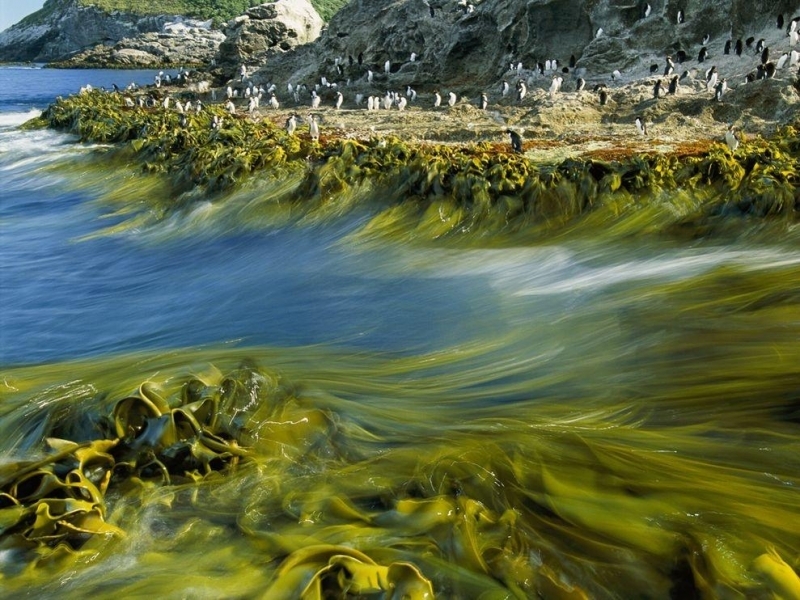 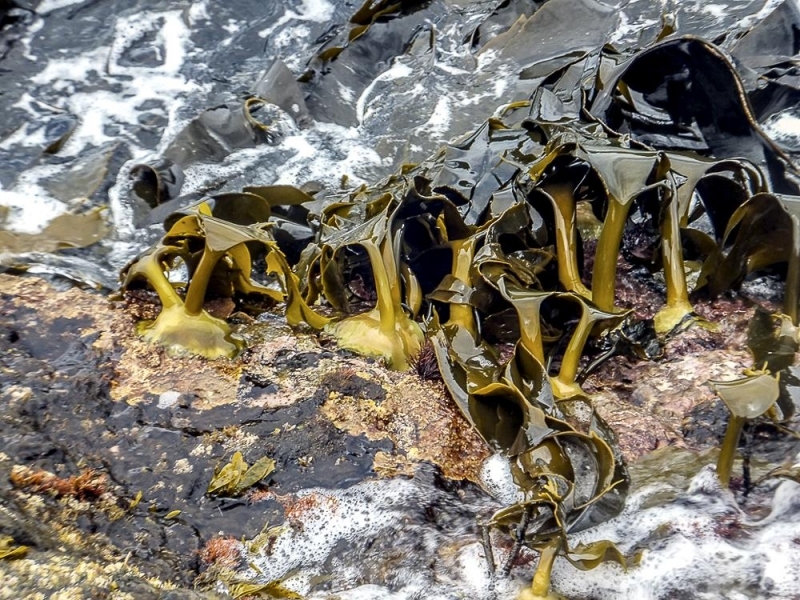 * Bull Kelp extracts are used as a thickener in products such as salad dressing, ice cream, hand lotion & paint. 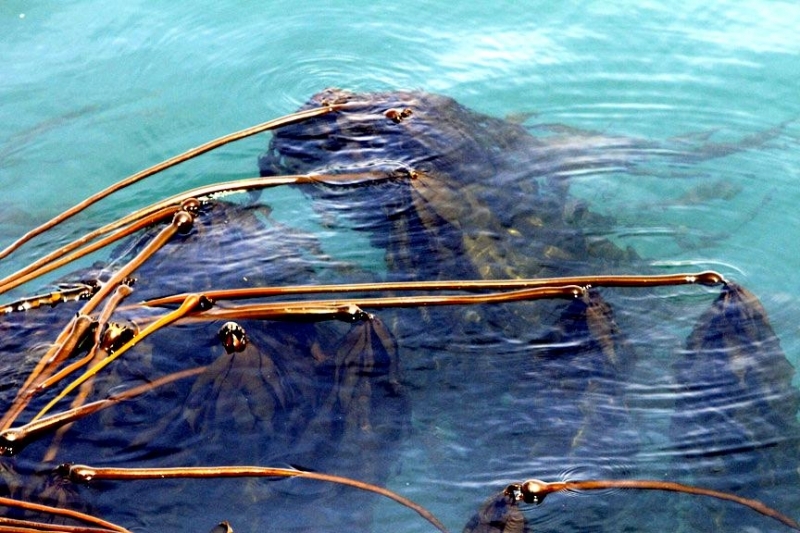 * Bull Kelp is often used to make sushi. 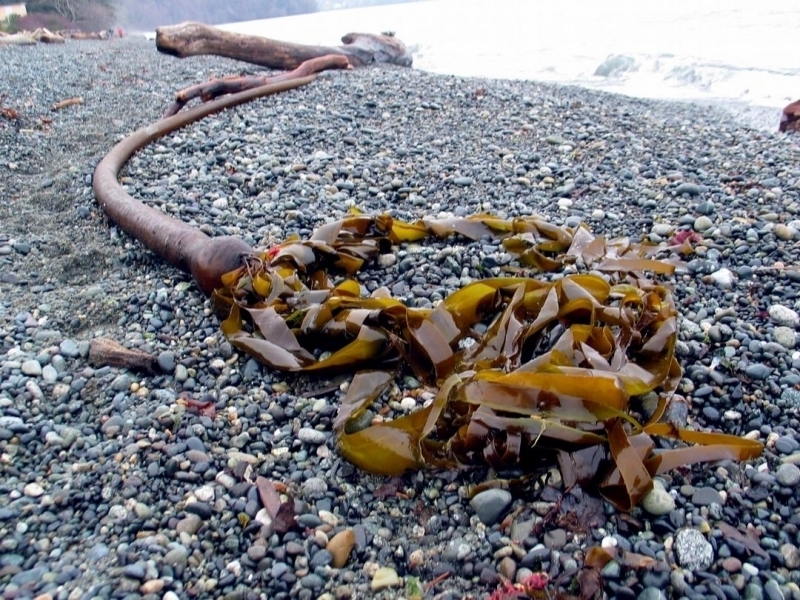 There are very nutritious recipes for Bull Kelp salads & soups. 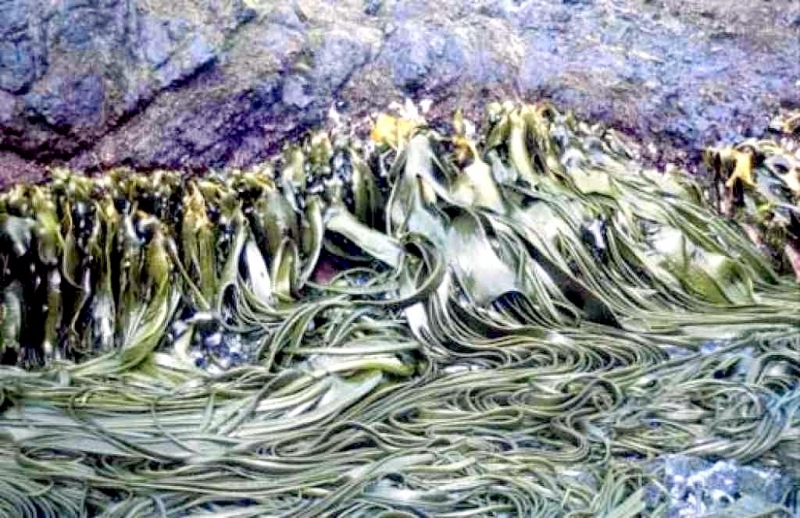 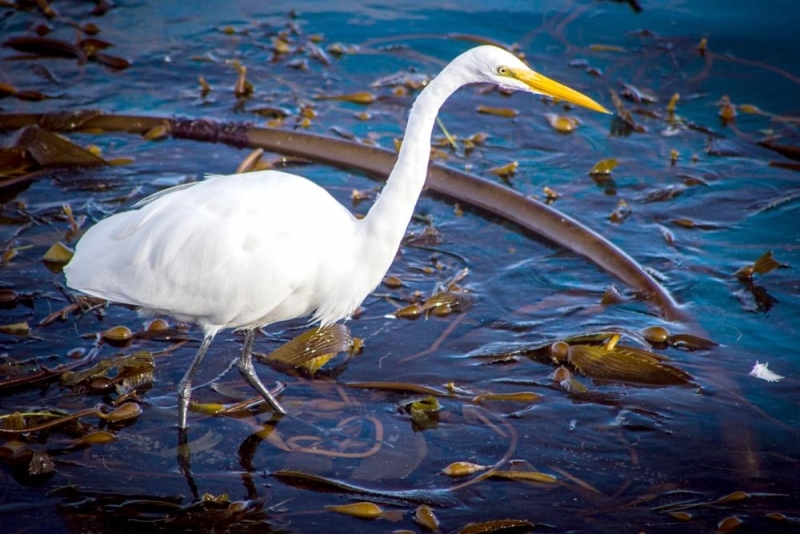 * As the Bull Kelp dies in the winter and washes up on beaches, it serves a useful purpose as a source of food and shelter for sand crabs, beach fleas & periwinkles. 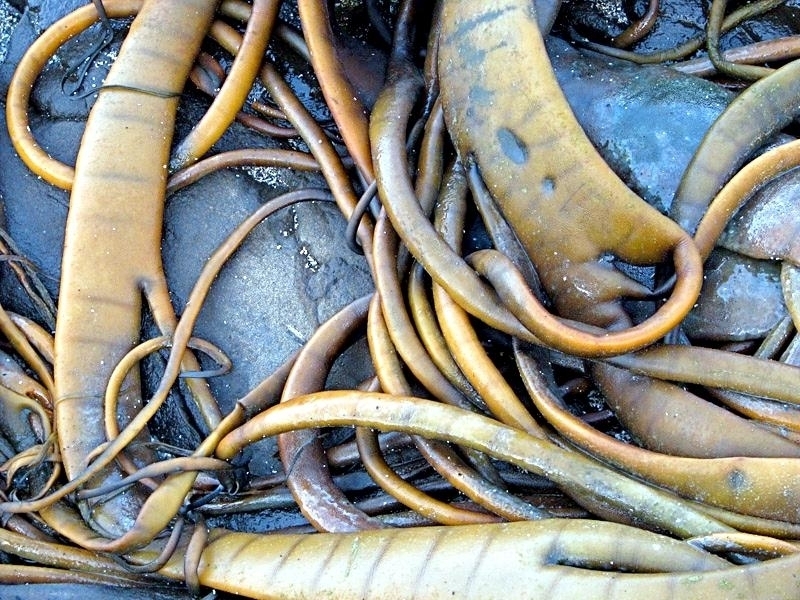 * First Nation Peoples used dried Bull Kelp stipe to make fishing lines.